You’ve probably heard of social stress – fear of fitting in, feeling anxious about meeting new people. Or you might have experienced stage fright – the stress of public speaking, performing, or presenting in front of people. But there’s another form of stress on the rise that’s potentially affecting Australians much more regularly and seriously than getting butterflies before giving a speech. It’s a different type of stress to… well… stress about. According to some researchers, close to one in three Australians suffers from significant financial stress. The consequences can be a lot worse than momentary embarrassment from tripping over your words. Alarmingly, nearly 35% of people experiencing financial stress have used drugs or alcohol to manage their negative feelings about money. (i) Chronic stress – something that’s experienced over a long time – can lead to physical symptoms, including sleep problems. The definition of stress is ‘mental/emotional strain/tension resulting from adverse or demanding circumstances’. Financial stress is when those circumstances have to do with money. As with other sources of stress, money problems can make people prone to withdrawing or lashing out at their loved ones. This in turn, detrimentally impacts family dynamics. 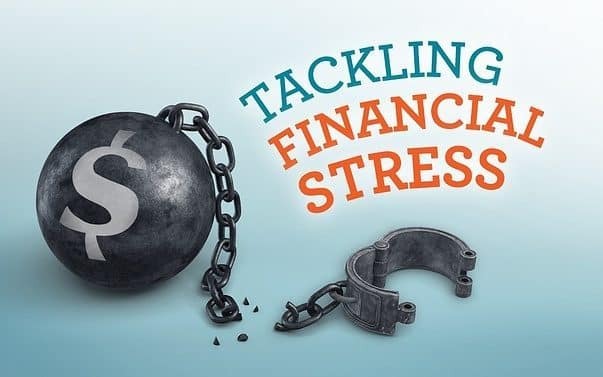 One regular report series by an Aussie bank discusses a few types of financial stress that affect most of the population. The main one is housing payment stress, which is expected to worsen in the future. Then there’s bill stress; sadly, about 16% of households can’t always pay their power bill on time. (ii) Some families always have to work to make ends meet; they’re experiencing low level but constant financial stress, which can also be damaging. It’s all too tempting to say that the solution to financial stress is ‘more money’. In fact, many studies on financial stress talk about how participants pin the blame for their stress on other people. On partners not telling them about joint account activity, or kids needing things they can’t say no to. And therein lies an important clue on tackling financial stress. Sometimes (not always), arguments over financial matters – a cause of financial stress – are themselves caused by miscommunication. That said, talking about money is never particularly easy. Even when it’s with a partner or loved one. That’s why it can help to create parameters for these conversations. One common ‘rule’ that low-financial-stress couples have is that they agree to discuss purchases from the joint account over a certain amount. Some also like to set ‘free spending’ limits for each family member (taking the form of pocket money for kids) so everyone feels like they’ve got a bit of both accountability and freedom. This is basically a function of household budgeting. Revise your budget regularly. Every time your income or expenses change, it’s time to review your discretionary spending. Thinking about large amounts of money and longer time spans can be overwhelming. If budgeting is stressful, try breaking it down to a daily or weekly calculation. Sometimes, anxiety can be caused by thinking about the same things over and over. Get it out of your head and write down the financial problems you’re worried about. Can’t keep up with which bills are due when? If you’re not already on direct debit (but could be), consider making the switch. See how long you can go without buying anything non-essential. Introduce a bit of friendly competition with your partner or older children. Approach each financial ‘problem’ as something that can, in fact, be solved. That’s the first step towards making an actionable plan. If you or a loved one are experiencing financial stress, let us help. Make an appointment today to discuss how you can tackle the source of your hassles head on.